Republic of what??? I thought we were in Montenegro. The properly sullen border guard tapped our passport numbers into his computer, carefully flipped through the many filled pages so as to stamp the paired documents in identical places, and we were off down the hill into Montenegro. It probably takes an hour or 2 by car to travel the coastal miles we'd covered in several days by bike. Miles in which we had gone from southern Croatia, through the maritime tip of Bosnia i Herzegovina, back into Croatia at Dubrovnik, and then through this border crossing into Montenegro--all part of the former Yugoslavia. My "I'm in a country for the first time" scanner was immediately drawn to the string of signs acknowledging outside funding for the many infrastructure improvements underway. There was the EU project for the new border station we'd just used and then work on the first city's water supply system was announced. The only thing German on this sign was the flag. We were familiar with these signs acknowledging the EU's generosity towards its non-member neighbors. The more surprising, though discrete, sign was for the German government's funding of a road project--curiously a road sign too small to be read by a passing motorist. 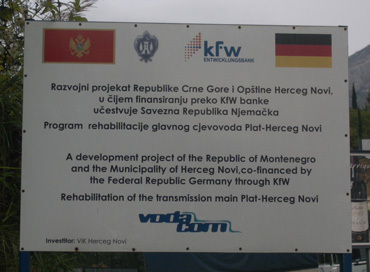 It reminded me of the many USAID project signs we had seen throughout Croatia and had me wondering if these eastern European countries each had a single major modernization sponsor in the west, like a Big Sister program. Within minutes in Montenegro we both found our muscles tensing because of the degradation in quality of life that was instantly evident as we cruised along the rural-feeling main road. The familiar north-south poverty gradient on the Balkan Peninsula was clearly in effect. It triggered apprehension--apprehension we've often felt in our bodies when in a developing country for the first time. A few minutes later we were vividly remembering the details of the step-down nature in the quality of infrastructure and level of maintenance when we crossed from Slovenia into Croatia and here it was again as we moved south from Croatia into Montenegro. We'd been in Montenegro's southern neighbor, Albania, in 2005 and knew it was another big step down from Montenegro to there. Only at the southern most tip of the Balkan Peninsula, when one arrives in Greece, do you escape the lingering oppressive economic burden borne by these former eastern block countries. We've learned to override the initial survival response that rumbles in the background: "Turn back, don't go on, don't risk it, stick with what you know is safe and comfortable." But of course, if one always follows that caution your world stays small. We continued on, holding our rising, non-specific anxiety in check as best we could. We looked at the scenery around us in Montenegro and knew it was in a worse state than in Croatia but it was hard to identify exactly what we were seeing that generated such a strong conclusion. A different look on the edge of our first city in Montenegro. I quizzed Bill about his criteria for labeling what he saw our first minutes in Montenegro as a 'poorer country'. Like for me, it was difficult to pinpoint though it didn't diminish his confidence in his conclusion. It wasn't any one thing but the collective impression of the highway edges that seamlessly merged with the pasture land, the large number of half-completed buildings, and the strictly utilitarian usage of private grounds that contributed to the conclusion of "poorer". While straining our brains to identify concrete differences in what we'd seen in Croatia and Slovenia from we were seeing in Montenegro, I realized that the dust roiling up around us from the passing truck on that damp day was one of those factors. We ride thousands of miles a year and rarely is dust kicked up on city streets unless we're in a construction area. It took a few minutes to realize that the presence of that dust was another marker for a poorer country as the more affluent countries literally keep the dust down by sweeping frequently--daily in some places. A tidy right turn on to the highway. Additionally, the prevalence of the old things sitting out and about made a comment about the state of affairs. 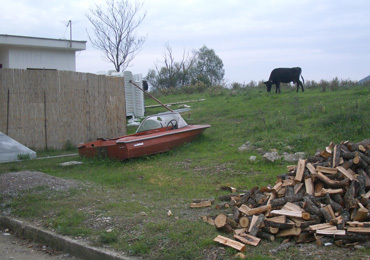 The old, old trucks and an old motor boat nestled in the grass caught our eyes as we'd seen models of these vintages in museums but in Montenegro they were on the streets. Cows out and about aren't necessarily an affluence indicator but we couldn't ever remember seeing a cow wandering alone in the suburban streets until Montenegro. 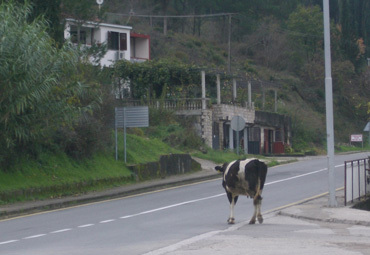 In Switzerland and Sicily we'd seen herded cows totally swamp village main streets and in rural Turkey we'd seen people walking with a cow on a rope like others would walk a dog, but in Montenegro a cow was heading out on her own and the men hanging around didn't bat an eye. Curiously, the number of dogs we spotted went from almost zero in Croatia to there almost being a dog in sight every where we were in our initial miles in Montenegro. First it was docile stray dogs, then well-mannered guard dogs, and finally too many limping dogs as we got closer to town. Once in the first small city, there were dogs on leashes or with their owners. After 6 weeks in Croatia and rarely seeing a dog (though hundreds of stray cats) we were seeing dogs of every disposition except attack dogs. A plate we'd not seen before our first day in the country. 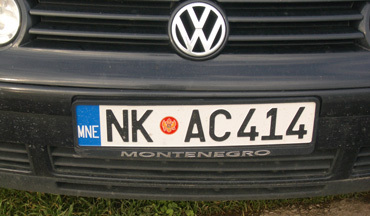 "MNE" for "Montenegro" was a license plate ID I'd never seen until the last town in Croatia, which in itself spoke volumes about the citizens of Montenegro. 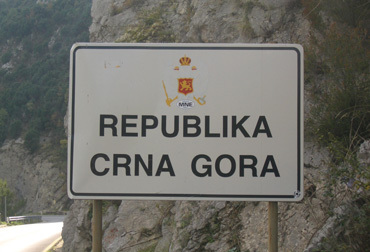 Being a near obsessive-compulsive license plate reader (so as to watch for changing tourism patterns), it said to me that the Montenegrins didn't get out much. The intense staring we received while on or with our bikes also suggested the converse was true: that the Montenegrins weren't visited much by a broad mix of tourists. The bug-eyed, grinning 10 year old boys and transfixed stares from the older men suggested that the other people were as startled by our presence but more practiced at being cool. We hadn't been stared at so much since we were in Tunisia in the late spring. It wasn't the kind of staring that we triggered in Tunisia that made me wonder what we were doing wrong but that disbelief kind of a stare like "You're not really going to do that, are you?" We smiled and waved and offered our Croatian hello of "Do ber dan" in response to the stares hoping to smooth our passage as best we could. But our attempts did little to ease our entry into the culture and we retreated to a more isolated spot in a slim park area for our picnic so as to take a break from the non-stop, though silent, attention. Even that didn't give us complete relief from 'spectacle status' but at least it reduced the 'stares per minute' quotient to a tolerable level. A semi-private retreat from the staring we received. It has always seemed odd to me that being stared at is so depleting as it is so passive but finally with this episode in Montenegro I found a way to make sense of my reaction. I think being stared at triggers a defensive response, which is what is draining about it. Being stared at is usually a signal that you are doing something others think is odd or inappropriate and in some situations, that you are being sized-up as prey. I can imagine that the human reaction to being the object of staring is hardwired in our deepest survival responses. I can imagine that it triggers an ancestral memory and a now-subtle array of chemical releases are initiated as a prelude to flight or fight. Fortunately the social staring we received wasn't actually threatening, though our systems processed it as though it were and we needed to periodically take breaks from it as we did in Tunisia. The first time we'd seen 24 hour water advertised for city lodging. The initial shock of our first impressions of Montenegro eased as we moved deeper into the tourist part of the northern most coastal town of Herceg Novi. The seaside board walk area had a more familiar Mediterranean feel with its mostly closed bars and souvenir shops. It however had that unkempt look that seems to come with low season at seaside resorts though it perhaps was a little rougher around the edges than most. While cruising the promenade near the town's old fort on our bikes I was pleased to have my attention drawn to several people dropping off materials at recycling bins. That was a rare sight in Croatia and spoke well of a more progressive attitude in Montenegro. But soon I was stunned at someone's lack of "getting it". 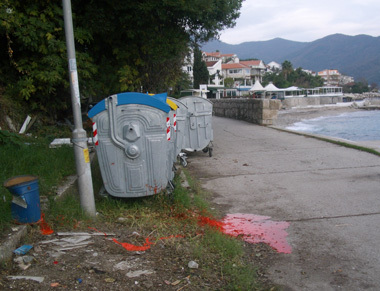 It was the pungent vapors at the next cluster of recycling bins that caught my nose; then it was my eyes that fixed on the orange paint oozing from a container by the bins onto the seaside promenade. The promenade seemed an odd place for a collection of dumpsters to begin with and the nearby sea an even worse recipient of the pooling paint. The solvent-based orange paint smelled as bad as it looked. Our eyebrows again raised, though for a different reason, as we began seriously looking for a place for the night. The outdoor sign for the tourist accommodation we were directed to by a local person advertized "24 hour water" in addition to air conditioning and TV. We were stunned as we aren't 'adventure tourists' and asking about running water had never been a part of our routine. We'd learned the hard way our first year in Croatia to inquire as to how many hours the hot water and the heat were available, but water being a variable in a tourist city was a new concern. Perhaps it was a hold-over like the old motels in the US that advertise having radios in the room. But it turned out that water wasn't the missing service in our room--it was electricity. Our first hours in Montenegro I'd kept saying to Bill "Does this remind you of Albania?" "Yes, but not as bad" was always his reply. But when the power went out he came back with: "OK, just like Albania." Unlike Bill, I'd forgotten about sitting around in our Albanian hotel room for hours without power. Our carefully shopped-for trophy TV and heat in our little Montenegrin room were suddenly useless and the prospects for preparing dinner looked grim. At least we'd asked for an extra blanket on this day when the sun hadn't made it out from behind the clouds, a sun that would disappear altogether at about 4:15pm. 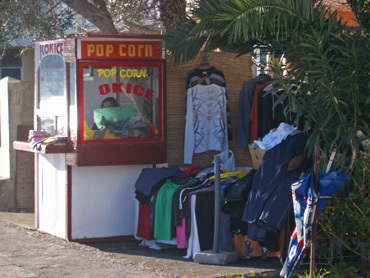 This popcorn stand was the indoor office of an outdoor shop. Our hostess reassured us in her limited English and ample sign language that the power would be back on soon--10 minutes, maybe an hour. After 10 minutes had passed a flashlight, lighter, and supply of candles discretely appeared on our balcony railing that she accessed from the empty unit next door. The candles were about half burned when the power was restored after more than an hour of sitting in the near dark: Bill working a new Sudoku puzzle and I thumbing in these words by the light of my PDA's screen. The rush was on when the lights flickered and then held: get the cook pot going, start warming the room with the heater, and recharge my PDA. We hoped to eat dinner and get one shower taken with the heating of our tiny water tank before the next outage. If we were lucky, a second shower and laundry would also be slipped in. "Welcome to Montenegro" I thought. Croatia was looking down right luxurious. My, what a difference in comfort and quality our 30€ bought in our second Montenegrin town of Kotor over our abode in Herceg Novi. That 'apartment' the first night had a hot plate, a tiny pan, a few mismatched dishes, and a refrigerator at the foot of our bed. The heater kicked out warm air on the not too-cool night though the damp room never felt warm. The TV screen seemed to have a sheet of orange cellophane wrap under the glass as all images were tinted an odd terra cotta hue. It was one of those rooms for which you have to agree that it had all the essentials and yet it was a relief to leave it behind in the morning. 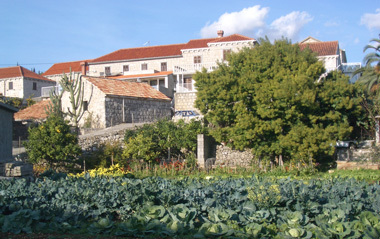 In contrast, our gem in Kotor was a full tourist apartment with a separate kitchen/dining room and a separate bedroom. The balcony had a view of mountains instead of the next building's wall. And on an even cooler day than we spent in Herceg Novi, it was cozy-warm when we arrived at sun down. The handsome though plain dishes, the higher quality towels, and the non-white walls all invited us to stay extra days in the decidedly more welcoming space. 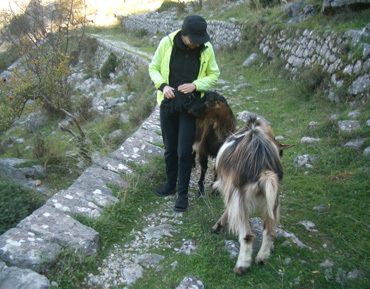 The long-haired goats became our hiking hosts. 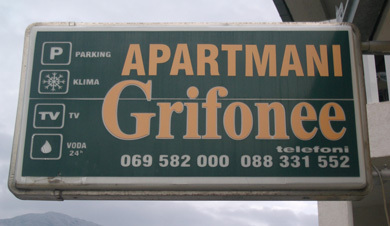 The difference in our apartments in Herceg Novi and Kotor were night and day: the difference between saying "Ahh...." in relief when I exited the first room for the last time and in pleasure upon entering the second room for the first time. Kotor was so much more pleasant in every way we decided to extend the experience by using it as our jet lag recovery town in March 2009 instead of Dubrovnik. 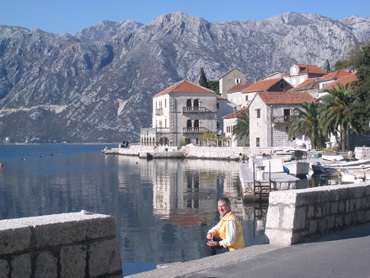 Paying half the price for a better space was only part of it as Kotor offered us superior hiking venues for reconditioning our climbing muscles at the beginning our 2009 touring season. Internet was quite a bit cheaper in Montenegro too as it ran 2€ an hour versus the 5€ we were paying in Dubrovnik ($2.50 vs $6.25 at that time); though the $25 we paid at the post office to make our weekly international call to our voice mail box was enough to make me want to throw-up. Luckily we'd only have to do that call once while in Montenegro. "Snow? Snow in seaside, Mediterranean, Dubrovnik on Sunday? You've got to be kidding!" was all I could say as Bill reported his findings after a chance look at the 10-day, online weather forecast. We were south of Dubrovnik, visiting Montenegro for the first time, with plans to continue further south in this our last biking week for the season. We'd been savoring a string of mostly sunny mid-November days that were just-warm-enough for leisurely picnics and were frequently congratulating ourselves on our good fortune. We'd thoroughly expected to finish our 10-day out-and-back into Albania without a hitch, returning to Dubrovnik in time to catch the twice weekly, overnight boat north to Rijeka. Making the 22 hour sea voyage would be the first step in a domino-falling like cascade of carefully sequenced events that would also include buses, trains, and a plane to deposit us, without stress, in Frankfurt on December 9 for our flight back to the States. Ample buffer days were built-in for each stage to allow for transport cancelled due to strikes, weather events, or other unforeseen problems. But the thought of arriving late in Dubrovnik, the starting point of the 2 week journey, was horrific. The forecasted thunderstorms and wind one day followed by snow and plummeting temperatures the next could slow us down and potentially hinder both the ferry and the only back-up bus transport too. Reluctantly we decided to end our exploration of the new country at Kotor, turn around, and head north to Dubrovnik the next morning. If the forecast held, we'd only ride in rain 1 day and be safely tucked-in in Dubrovnik before the brunt of the storm whipped up the seas and the snow fell. The downside of yielding to the weather threat was spending 5 days instead of 1 day in Dubrovnik. Dubrovnik's old town is stunning but we far preferred to get our exercise on the road looking at new scenery rather than hanging out in town. We also knew that there was a risk that the forecast would improve and abandoning on our planned itinerary would then feel foolish. A last look at the back roads of Croatia for 2008. But turn around we did and Bill routed us onto a challenging hilly back road rather than the main road to elude the truck traffic on the last forecasted dry day. Avoiding the trucks would be safer but we also wanted the quiet time so as to better say our private farewells to the sweet-side of our cyclotouring life for the year. We wanted to focus on the backdrop of steep mountains and the glimpses of the sea; we wanted to study the nuisances of the vegetation: the olive trees, kiwi vines, and scrub; we wanted to catch the occasional whiff of orange blooms; we wanted to deeply feel the warmth of the late fall sun--all things that would soon disappear from our lives until next March. Savoring the last ride of the season was an annual ritual that we were sometimes cheated out of by worsening weather but we had one chance at briefly honoring the last ride of this year. We'd somewhat arbitrarily given the snow forecast a 50-50 probability since 1 website called for snow and the other forecasted a dry day, though they agreed upon the timing of the temperature plunge. We erred on the side of caution but weren't too surprised when the forecasted snow disappeared before it fell. "Prudence" we reminded ourselves. This carefully choreographed heading- home dance required that we reign-in our usual adlibbing style and instead commit to arriving at a series of designated points at designated times. Now, as we would be for all the months Stateside, we were boxed-in by our calendars and the clock. We watched as the series of storms fizzled by the time they reached Dubrovnik--storms fueled by frigid Arctic air that had dumped heavy snow and dished out damaging winds in northern Europe. Luckily for us, most of our rain and all of our lightning storms occurred over night. We'd watch from the high window in our Dubrovnik room as the remnants of the northern storms tussled with the breezes from the south--sometimes the prevailing winds would come from all 4 points on the compass in the course of an hour and include some peculiarly still intervals. On 2 days there was enough sun to warm us between windy spells or when sheltered as we ventured out for our fitness walks. The highs in the mid-40's with wind chills near the freezing point would give way to temperatures around the 60 degree mark when the steady rain took hold. 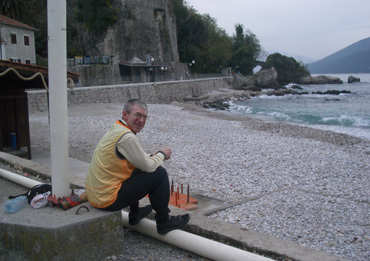 Had we'd known how the storms would have played out, we could have continued our trek into Montenegro. But we'd high-tailed it back to Dubrovnik where the white-knuckle truck route traffic in and out of the city limited day rides to the realm of fantasy. Instead we'd switch modes from 2 wheels to 2 feet for our daily exercise. The altimeter to measure elevation gains moved from my aero bars onto my backpack as we strove to collect at least 1,200' in elevation gain each day. That's an arbitrary target that seems to correlate well with the level of fitness we like to maintain when not riding. Hillside Dubrovnik made it easy to rack up some of the gain on our daily outing to the market. 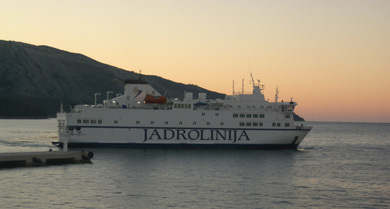 An Adriatic ferry like this one would take us north to Rijeka. The too-plentiful other hours of the days were spent culling our gear, item by item, like we had never taken the time to do so systematically. Each band-aid, button, and map was inspected for its current utility: "Is it still relevant? It's useful but will we use it? Is it outdated, dried up, or obsolete?" were the questions asked over and over again. Some items were discarded, some would be left in Dubrovnik with the bikes for the 2009 season, and others would go home not to return. As we sifted through our gear it quickly became clear that the trickiest mental gyrations were for the items that would go home with us and return solely for use during our jet lag lay-over week in March before we picked up the bikes. Then there were items like a gallon of water and ginger root for motion sickness that would only be used on the overnight ferry; eye covers and earplugs were sorted for use on the overnight flight; extra heavy socks were set out for the sightseeing days in snowy Bonn; and Croatian ferry and bus schedules were tucked away to be handy for our return in March. If the luggage restrictions weren't so tight, we'd loved to have taken everything home with us to run through the washing machine or give them the TLC we can only give at home. But the reality of shrinking weight limits meant we were left to hand washing things before storing them for 4 months, and washing them early enough for a thorough air drying before packing. This process of dividing our gear into 2 piles: the items that go home with us and the things that are stored with the bikes, punctuates the end of the cycling season. And if we managed to stay in denial through that process, it becomes perfectly clear with the next step: actually parting from our bikes. Leaving the bikes frees us of a luggage burden but it also means we've just morphed into tourists heading home at the end of a long trip. This time we'd have an almost 2 week transition as bike-less tourists before the more serious side of life was upon us back home. It's been almost 4 months since we left Kotor back in November for our annual visit at home. We flew back to Europe on March 12 and spent 5 days making our way back to Kotor. We are now enjoying scrambling up the hillsides above Kotor to buff up our quads and scrambling to get our backlog of 2008 webpage updates online. It's a pleasant routine however as we recover from jet lag in this lovely old stone village on the fjord-like inlet of Kotor Bay. Our tourist apartment is warm and cozy despite a fierce, snowy storm that just blasted the Mediterranean region and we are welcoming the time to transition from 3 months at home to being tourists again. We left the States with more things unfinished than usual, so in addition to the webpage backlog due to our computer crash last September, we have a number of other chores to complete before rejoining our bikes in Dubrovnik at the end of this week. There are the endless electronics chores and more basic things like getting those new bike helmets to fit just right on our heads. We'll be on our bikes soon and the flag will drop on our 9th season as overseas cyclotourists.